COUNCILMAN FRITZ SCHERZ ANNOUNCES 10th ANNUAL SCHOLARSHIP FOR VOLUNTEER COMMUNITY SERVICE! Fred “Fritz” Scherz, Jr., Councilman on the Verona Town Board in Verona, NY, has again created the Fred Scherz Sr. Memorial Scholarship for Volunteer Community Service. The 10th annual scholarship will be in the amount of $250 and will be awarded by Fritz to a Town of Verona, New York student who is on track to graduate from 12th grade at a high school (public or private) or home school by June 30, 2019. Additionally, the student must have lived in the Town of Verona, New York since at least December 1, 2018, and must be voluntarily engaged in community service or must have created a community project that benefits the Town of Verona. www.fritzscherz.com, his Twitter feed at: www.twitter.com/fritzscherz, his blog at: www.fritzscherz.blogspot.com, or call: (315) 363-3509. Deadline to apply is May 24, 2019. 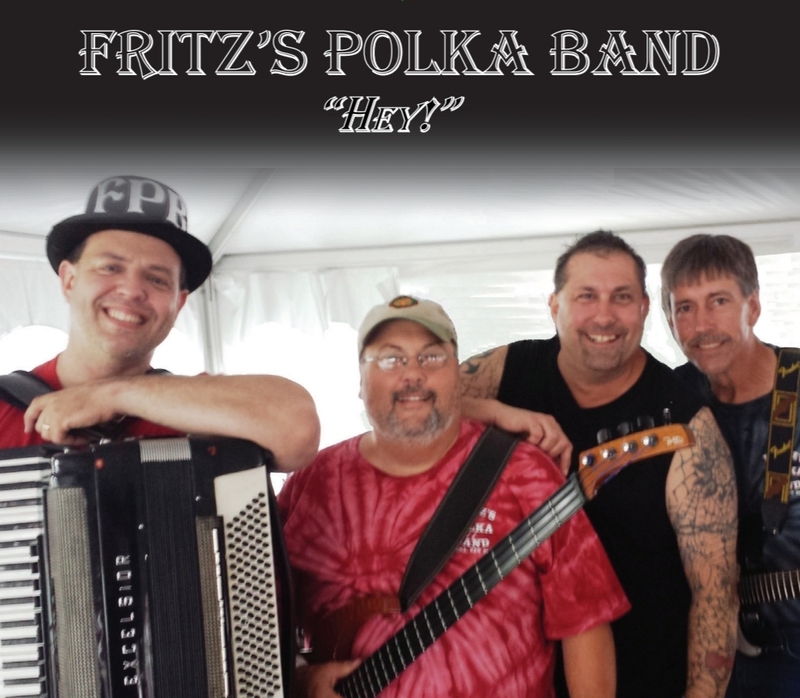 FRITZ'S POLKA BAND TO RELEASE 19th RECORDING! was recorded at SubCat Music Studios in Syracuse, NY and features 12 original tunes of which over half are polka and waltz, yet also includes other styles. “Hey!” also features the following special guests: Rocko Dorsey, Ron Keck, and Todd Kerns (from Slash featuring Myles Kennedy & The Conspirators, TOQUE, Age of Electric and more!). It will be available at FPB gigs, by direct order from FPB namesake, Fritz Scherz, as well as on CD Baby, iTunes, and other on-line outlets as well. 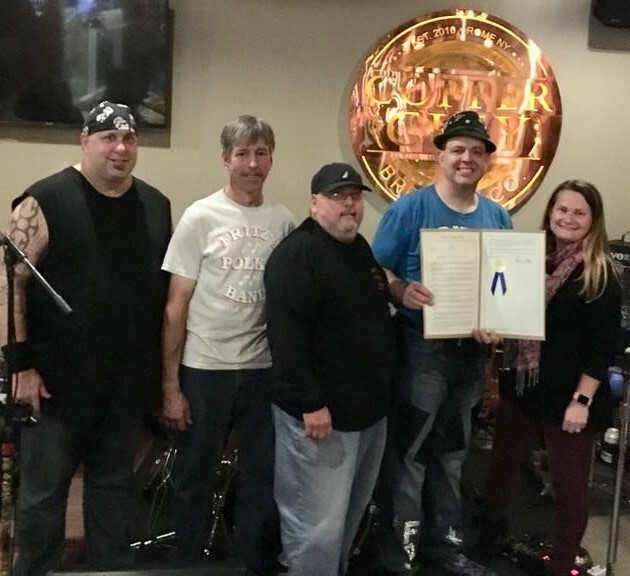 October 14, 2018 marked the 40th anniversary of Fritz's Polka Band! FPB made history in 1999 by becoming the first polka band to play at a Woodstock Festival. FPB appears on "The Manchurian Candidate" DVD, released in 2004. In 2011, FPB had two songs (‘Grandparent’s Polka’ and ‘Here Is Fritz’s Polka Band’) included in two episodes of the TV show, ‘Breaking Bad’. In 2013, FPB released their 18th recording, a double live CD entitled, “The WSKG Sessions”. In August 2018, FPB and each band member were again nominated for national awards by the Cleveland-Style Polka Hall of Fame. For more information on Fritz’s Polka Band, view the band’s website: www.fritzspolkaband.com, Facebook page at: www.facebook.com/fritzspolkaband, their Twitter feed at: www.twitter.com/fritzspolkaband, and/or their Instagram at: www.instagram.com/fritzspolkaband. COUNCILMAN FRITZ SCHERZ TO HOLD 9th ANNUAL TOWN-WIDE HOLIDAY PARTY! 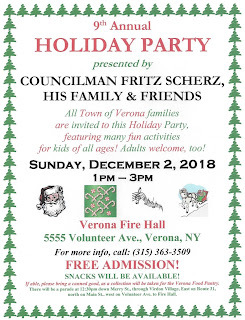 Fred “Fritz” Scherz, Jr., Councilman on the Verona Town Board, will hold his 9th Annual Holiday Party for all Town of Verona residents on Sunday, December 2nd from 1pm to 3pm at the Verona Fire Hall (5555 Volunteer Ave.) in Verona. Preceding the holiday party will be a mini parade starting at 12:30pm from the Verona Fire Hall, going through Virdon Village via Merry St., east on Route 31 to Main Street past J. D. George Elementary School and onto Volunteer Ave. back to the Verona Fire Hall. Folks are encouraged to line the parade route to wave to Santa Claus as he makes his way to the event. 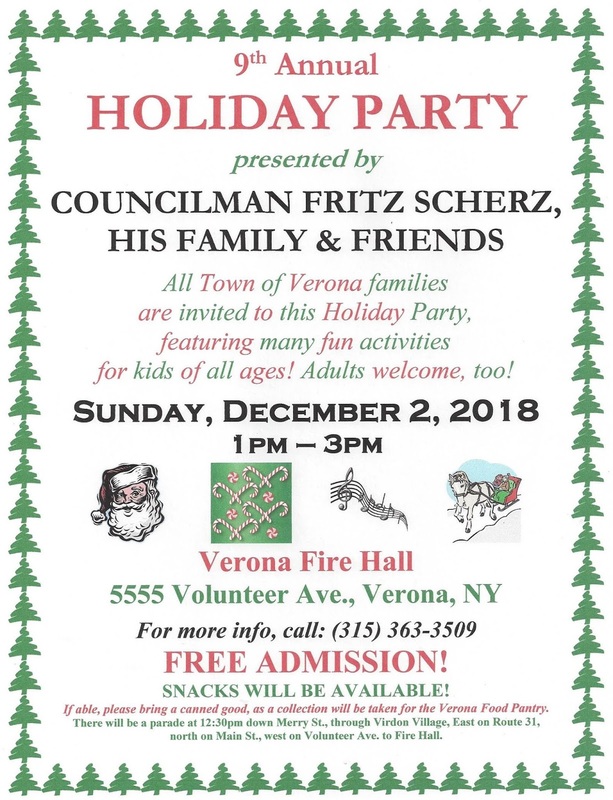 The Holiday Party for all Town of Verona residents has free admission and snacks will also be available. If able, attendees are asked to bring a canned good, as a collection will be taken and given to the Verona Food Pantry. For more details, go to: www.fritzscherz.com and/or contact Fritz at: fritz@fritzscherz.com and/or (315) 363-3509. If any businesses want to inquire about making a donation, please contact Fritz. 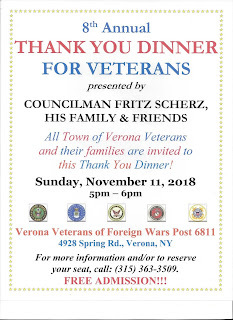 COUNCILMAN FRITZ SCHERZ TO HOST 8th ANNUAL THANK YOU DINNER FOR VETERANS! 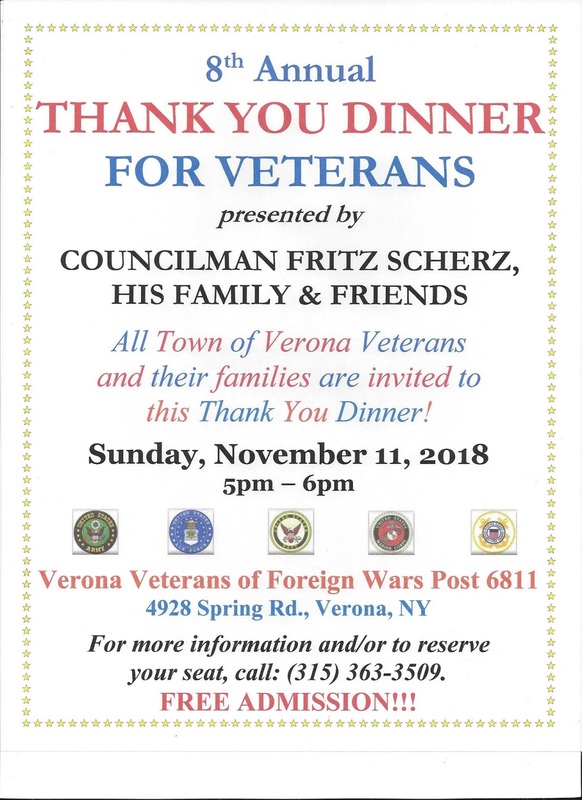 Dinner for all Town of Verona Veterans and their families on Sunday, November 11th from 5pm to 6pm at the Verona Veterans of Foreign Wars Post 6811 (4928 Spring Rd.) in Verona. fritz@fritzscherz.com and/or (315) 363-3509 by November 8th so he can better plan on how much food to have. Plus, if folks have any food allergies, Fritz wants to plan accordingly. For more information on Fritz, go to: www.fritzscherz.com, Fritz’s Twitter feed at: www.twitter.com/fritzscherz, and/or his blog at: www.fritzscherz.blogspot.com. 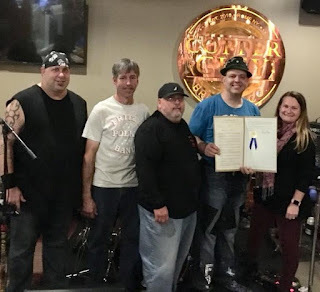 FRITZ'S POLKA BAND RECEIVES LEGISLATIVE RESOLUTION BY NEW YORK STATE SENATOR, JOE GRIFFO! October 14, 2018 marked the 40th anniversary of Fritz's Polka Band! FPB made history in 1999 by becoming the first polka band to play at a Woodstock Festival. FPB has made 18 recordings and appears on "The Manchurian Candidate" DVD, released in 2004. In 2011, FPB had two songs (‘Grandparent’s Polka’ and ‘Here Is Fritz’s Polka Band’) included in two episodes of the TV show, ‘Breaking Bad’. In 2013, FPB released their 18th recording, a double live CD entitled, “The WSKG Sessions”. Last year, FPB was nominated for three Just Plain Folks Music Awards and each member was nominated for national awards by the Cleveland-Style Polka Hall of Fame (CSPHOF). In August 2018, FPB and each band member were again nominated for national awards by the CSPHOF. Fritz is a Councilman on the Verona Town Board, a Musician in Fritz's Polka Band, and an Adjunct Professor at Morrisville State College (Norwich Campus).